Resident Evil makes it Next-Gen debut and first time outing on Microsoft's Console. The first feature that drew me in was the game's impressive visuals. The power of the PS3 and 360 definitely help bring the environments and creatures to life in this game. First things first, the story still revolves around a virus that could possibly destroy humanity and it's up to Veteran Chris Redfield to stop it. But he'll have some help. You! 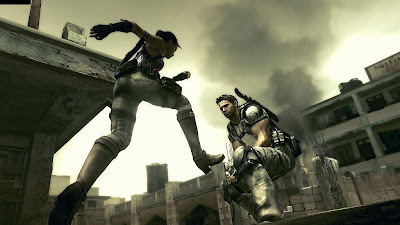 This time around players are put in the shoes of Expert Chris Redfield and Sheva Alamar. That players is no typo, Resident Evil is now a fully Cooperative experience and can be played via splitscreen, system link, and online. 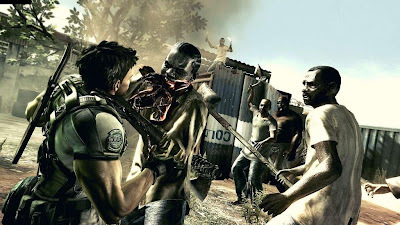 The game shines when there are two real players taking on the many infected in the game, although it still is fun to play alone if still want that classic Resident Evil experience. 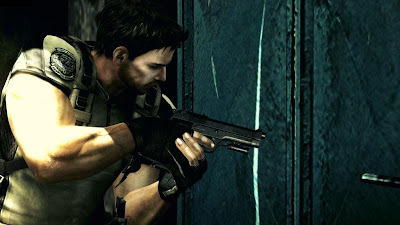 Resident Evil 5 expands upon the phenomenal gameplay that was in Resident Evil 4. Over the shoulder third person action is still here, along with a few tweaks although you must still stop to shoot. Those who played and enjoyed RE4's style will be right at home here, although it would have been nice to totally control the camera and shoot the way Dead Space controlled. 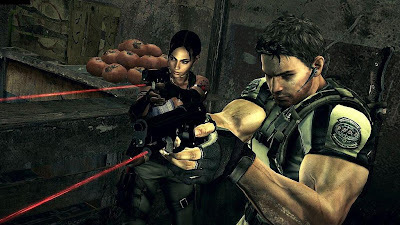 That may be a turn-off for some, but Resident Evil 5 is still a great game to play. 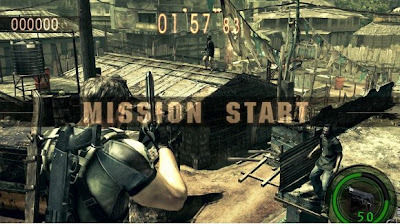 The replayability comes into RE5 with the extra content you can unlock after completing the game. Upgrading a gun to it's full extent will give you the option to have unlimited ammo, and also purchase more expensive and powerful weapons, and collecting emblems throughout the game will unlock alternate costumes for Chris and Sheva. The Fun and Addictive mode Mercenaries returns, and adds some co-op and online play. There are about 8 levels to play in and players can also unlock new characters that carry different weapons. This mode also adds leaderboards so you can see how you and a friend stack up against teams around the world. This mode could actually be an Xbox Live Arcade game thanks to the fun and replayability contained in it. Upcoming DLC will also add multiplayer to the game and will feature modes supporting 4 players. This content has been talked about negatively and positively as it will cost 5 dollars when it arrives on PS3 and 360. Overall Resident Evil 5 does a good job representing the Resident Evil Name despite not evolving in a way Resident Evil 4 did.